Dr. Karina F. Leal, D.M.D is originally from New York. She received both her D.M.D. degree and her certificate in Periodontology from Temple University School of Dentistry in Philadelphia, where she received numerous honors. Dr. Leal is a Diplomate, of the American Academy of Periodontology. 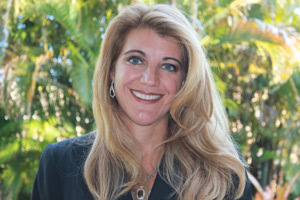 Dr. Leal has served on the board and has been past president of both the North Palm Beach and Central Palm Beach Dental Societies. She has been and is involved with the Palm Beach State College Research Clinic and various study clubs. She holds active memberships in the American Academy of Periodontology, Board of Periodontology, American Dental Association, Florida Dental Association and Academy of Osseointegration, among others. She is member of the Pierre Fauchard Academy, an invitation only organization. Dr. Leal has co-authored and has been sited in numerous journals. She has contributed to lectures and programs highlighting the use of periodontal procedures to optimize dental esthetics, as well as implant dentistry to maximize esthetics and function. Dr. Leal limits her practice to periodontics and implant dentistry. She not only strives to provide the best outcome in periodontal health using regenerative procedures, but utilizes conservative techniques to obtain excellent esthetics in implant dentistry. Utilizing digital dental cat scans, she is able to preplan surgical treatment in a three dimensional environment to ensure optimal results. Implants can often receive temporary crowns the day of placement. Dr. Leal is passionate about incorporating the advances in digital dentistry to provide her patients with the most advanced dental technologies.